First, the decision of the Federal Reserve not to hike interest rates in September, even while it left the door very much opened for a 2015 hike. Second, the generalised rout in emerging market currencies, which, in most cases, weakened to all-time lows against the US Dollar. The impact of the Fed’s decision not to hike rates in September was muted by subsequent hawkish commentary from Fed officials. They suggest a hike may be forthcoming at either the October or December meeting and, unsurprisingly, the US Dollar has now recovered all of the ground it lost after the no-hike announcement. For its part, the ECB is sounding pessimistic. It continues to downgrade its expectations for growth and inflation, and considers enhancing its quantitative easing program. Recent disappointments in inflation and employment should spur the ECB into action by the end of this year. Therefore, the main theme – of diverging monetary policies across the Atlantic, and to a lesser extent across the channel – remains intact. 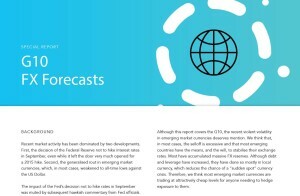 Read on for in depth analysis of the G10, their economies and their currency fluctuations.